The Map serves as a hub to access new missions as well as ongoing missions. From here the player is able to send vehicles to the Asteroid Belt, Deimos -- Mars' Moon, or Mars and can track the overall progress. For locations to be accessed they must first be unlocked by acquiring satellite date, which requires budget money to do so. Selecting a one of the locations from one of the main maps, the player will access a new map showing details about missions and vehicles. 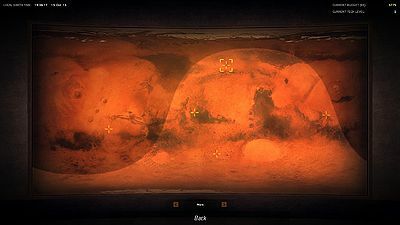 If the mission does not have an assigned vehicle, the player may send a new one to complete it, or assign a vehicle on the surface that is close by and can complete the objective. This page was last edited on 16 October 2013, at 01:46.